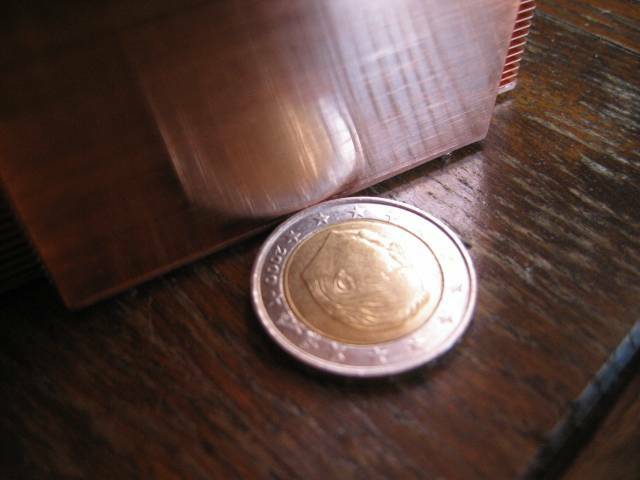 Basically there are two materials to make Heatsinks from : Aluminum and Copper. There are other materials with much better qualities than these two like Diamond, but either they cost way to much or they are too hard to work with. Main difference between Copper and Aluminum are : Copper has a higher thermal conductivity (401 W/m.K) than Aluminum (237 W/m.K). Aluminum (897 J/kg.K) has a higher heat capacity than Copper (385 J/kg.K). And another difference is that Copper (8933 kg/m³) weights about three times as much as Aluminum (2702 kg/m³) and Copper is harder to work with than Aluminum. So pure theoretically what does this mean for a Copper and an Aluminium heatsinks with exactly the same design? 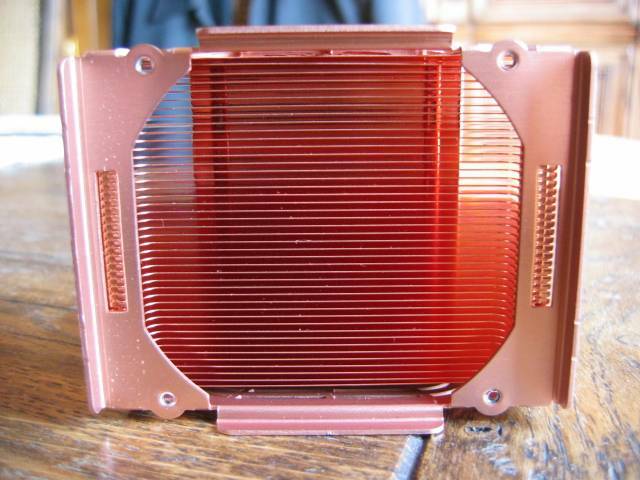 Copper heatsinks have a better thermal conductivity, so it will transport the heat from your CPU faster than an Aluminum heatsink. Aluminum has a better heat capacity, so pure aluminum can take up about 2.3 times more heat before it raises one degree in temperature. 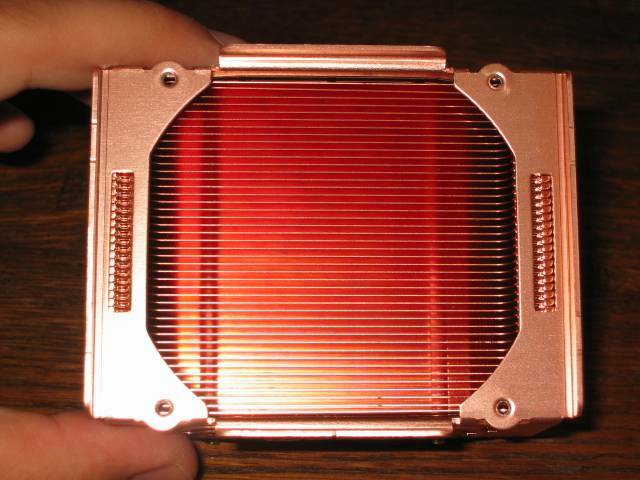 But in reality the difference between Copper or Aluminum heatsinks is not astronomical high. Why? Air is the answer. Air only has a thermal conductivity of 0.025 W/m .k and lets say for example that your CPU produces 60W of heat then you need a cooler which can blow away 60W of heat, and something like that is simply not possible. 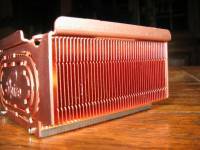 But Copper gives a significant difference at the core, the higher heat conductivity of Copper gives a little bit higher temperature gradient, so it can conduct just that little bit more heat than Aluminum because air is not the big resistant there. 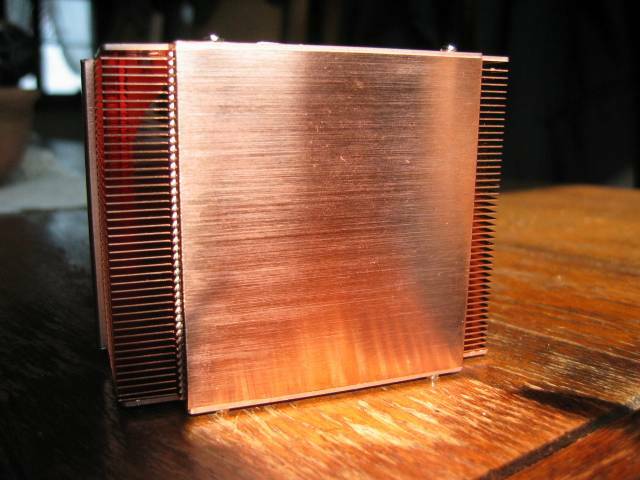 The Aluminium heatsink will have a higher temperature at the core than the Copper heatsink. And your CPU ofcourse likes a lower temperature at the core. 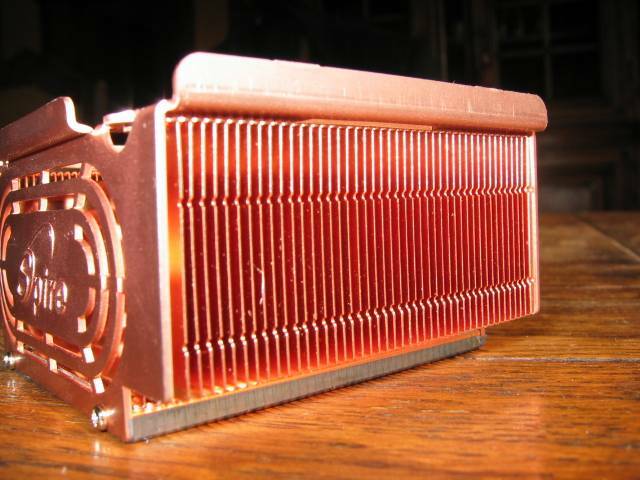 Currently most heatsinks are made out of Aluminum, Copper or a combination of both. These combinations will have a round or square piece of copper where the heatsink touches the CPU. 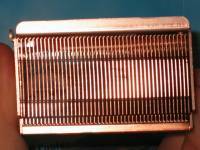 Things that really can make a difference in performance is the design of a heatsink, pins and fins all try to make the contact surface with air as big as possible and how bigger the surface how more it can spread his heat and copper does this better. Another very important thing is the fan, a powerfull fan will draw the heat away much faster than a weak fan. 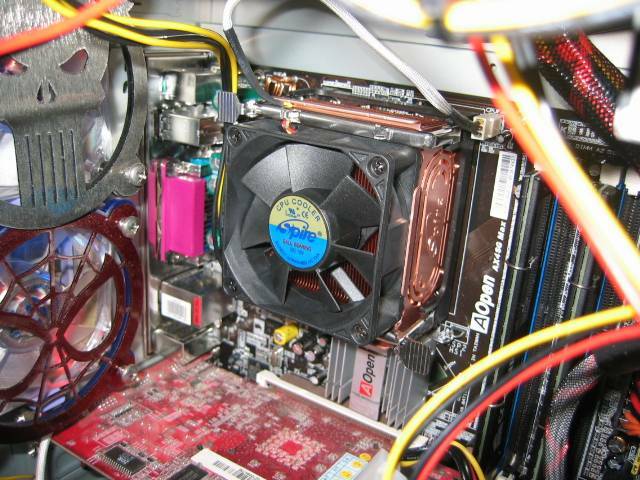 Also a good contact between the CPU and heatsink is important! Lapping or thermal compounds are used to make the surface as flat as possible. 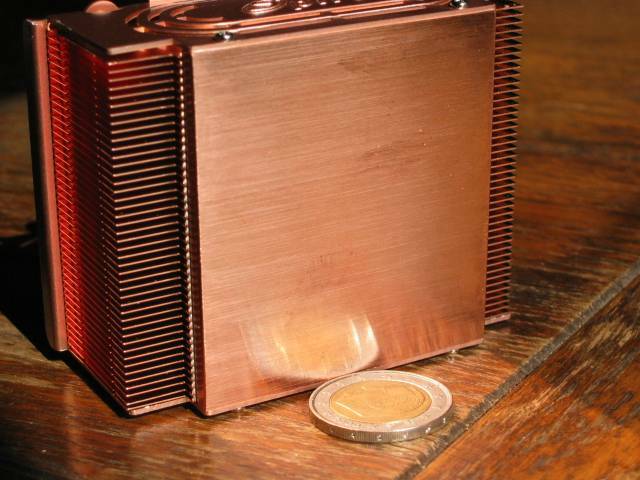 So between Copper , Aluminium with Copper base and Aluminium heatsinks with exactly the same design and fan the Copper one will be the best, and the Aluminum one the worst. But the difference will only be a few degrees. 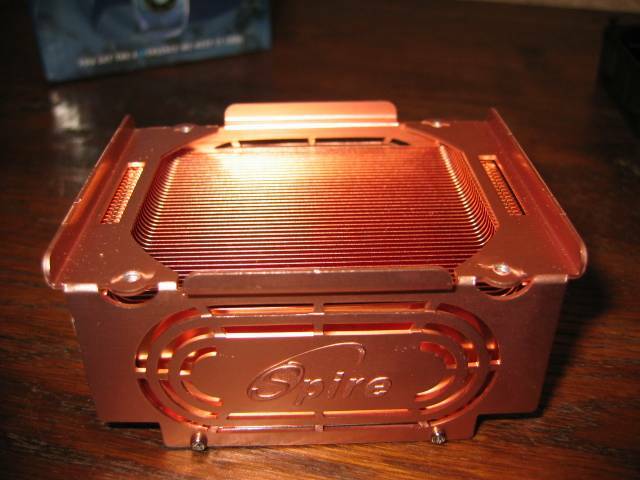 Today we take a look at the new Spire SP420B8 CopperStream HSF, this heatsink is entirely made out of Copper. 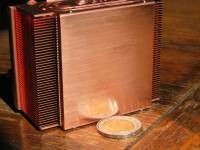 The new all copper cooler based on Micro-fin Stamping technology called the CopperStream™ is completely designed and manufactured by Spire. 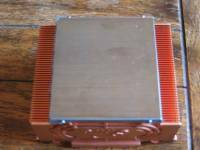 This latest Micro-fin Stamping technology greatly improves the thermal performance while keeping the weight of the heat sink fan unit down to 290gram. 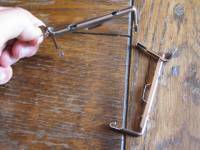 This means that the base, and the fins are made out of one piece of Copper, and not two or more pieces that are joined together. This will ensure maximum heattransfer between the base and the fins. At the bottom of the heatsink we found a piece of plastic to protect the base against scratches and dirt. Obviously you need to remove this before installing the heatsink to your cpu. Now lets take a look at the bottom. The base feels flat but it has some machine marks on it, and it is not really a mirror like finish. 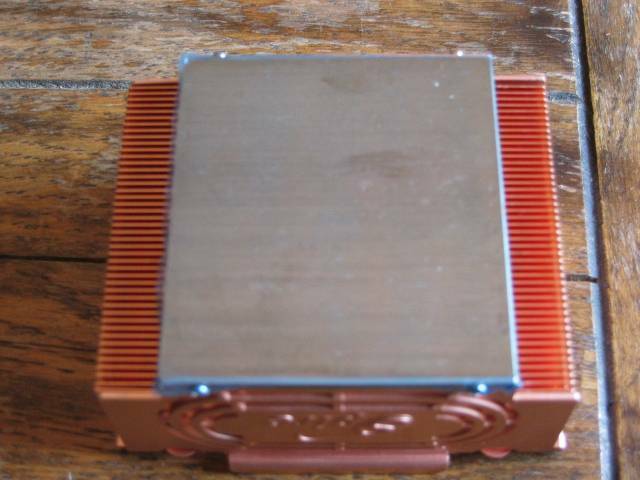 However I have seen worse in the past, but if you really want maximum performance of this heatsink then I recommend that you give the base a good old lapping. Take for example a look at the last picture of this Lapping guide on GideonTech. That is what we mean with a mirror reflective finish! 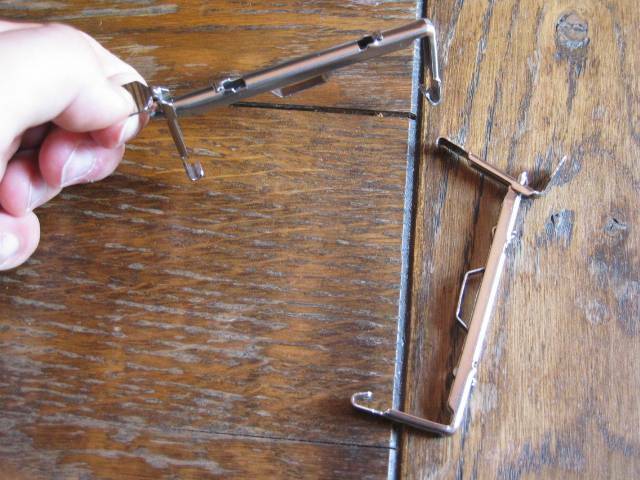 On the left we have the two clips, which you have to use to attach the heatsink to your CPU socket. To the left we have the included thermal compound from Spire. When you mount a heatsink it is really recommended to use a thermal compound, this tries to fill all the micro gaps between your heatsink and CPU to ensure maximum heat transfer. A nice thing about the included thermal compound is that Spire delivers it in a syringe and not in a plastic bag like I have seen in the past with some other heatsinks. 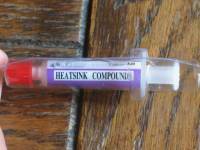 A syringe makes the applying of thermal compound somewhat easier and less messy. I have not tested the compound from Spire but I doubt that it will give more than 1 to 2°C difference with the thermal compound (Artic Silver Céramique) that we used. 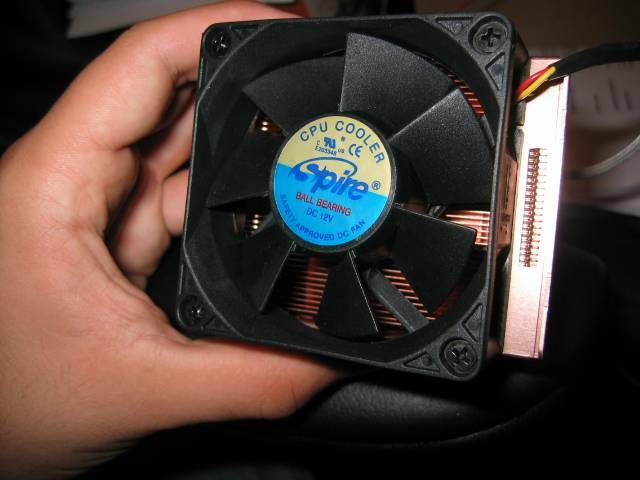 The fan is a 70*70*25mm one. It pushes 22.05CFM of air at 2500RPM, and this with a noise level of 25.0dBA. 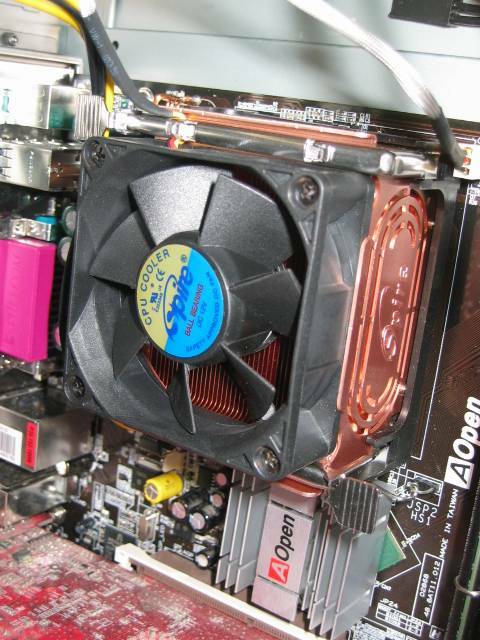 This is relatively quiet, most power supply fans, or case fans will have a higher noise level. The other two pictures show the Spire CopperStream installed in our test system. 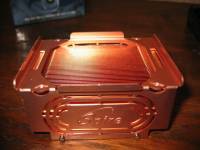 Now lets move on to the testing to check out how good or bad this heatsink performs. * Load temperatures are with Folding@home, Prime95, Windows Media Player (yeah I was listening to a web radio :P), Speedfan, Outlook express, and two internet explorers running. CPU usage was mostly very close to 100%. * We compare the Spire SP420B8 CopperStream with the standard HSF that came boxed with the Intel Pentium 4 2.8C CPU, on both heatsinks we applied Artic Silver Céramique. All temperatures were monitored with Speedfan. * Please also keep this in mind : There was a slightly difference in ambient temperature, the temperatures of the Spire CopperStream were monitored two days later than the stock HSF : the ambient temperature with the standard HSF was 25°C, the ambient temperature with the Spire HSF was 24°C. 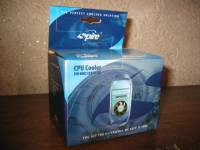 * The overclocking test was with our processor running at 3.30GHz (236MHz*14). Compared with the standard HSF of the Intel Pentium 4 2.8C CPU we saw a drop of 4°C in idle mode, during load the difference was bigger, it runned 9°C cooler. 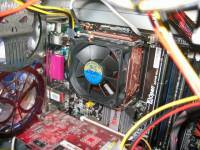 For this test we overclocked the Pentium 4 to 3.3GHz. In idle mode the Spire CopperStream was 3°C cooler. During load the Spire CopperStream was 7°C cooler. In both situations the Spire Copperstream never went above 35°C during 'normal' mode, with this I mean a normal situation for myself like writing this review or browsing the web. (At the moment the following applications were opened ; Outlook Express, three internet explorers, Windows Media Player (listening to Studio Brussel webstream, our Belgian readers will probally know this ;), Paint Shop Pro, MSN and Speedfan. The Spire CopperStream actually supprised me. While the test results from the standard Intel HSF are surely not too bad, the CopperStream from Spire does even better. Especially because relatively it is offering some very good performance for a noise level of only 25dBA! Most other fans in my case have a higher noise level actually, so only in real quiet systems you will be able to hear the noise comming from the CopperStream. 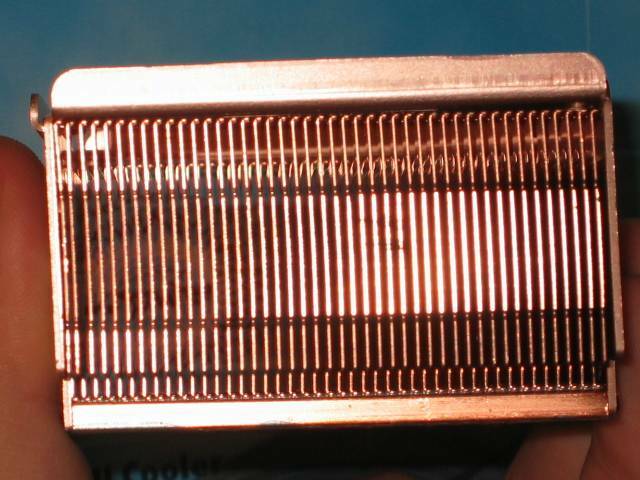 Actually I'm wondering what a higher performance fan could do for this heatsink. Maybe this is one of the features that this heatsink is missing, the ability to install an 80mm or 92mm fan on it, with fan clips for example like some other heatsink makers do. 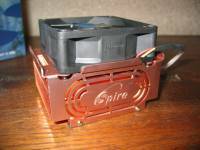 According to Spire the average retail price should be around €29, which is as good as equal to $29.This is a good price, good heatsinks vary from around $25 to sometimes even $60. 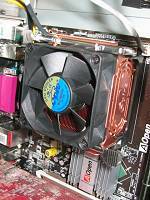 - Heatsink bottom could use some more lapping for maximum performance.